The Quechua Arpenaz 20 is a 21L backpack designed for day hikes, however it is actually a very durable, lightweight and capable carry on bag. The Arpenaz 20 weighs in at 340g (12oz) and its dimensions are H 48 x W 24 x D 14. For such a lightweight bag it actually packs a lot of features. It includes 2 mesh side pockets, a front pocket and a large main compartment. Surprisingly they also managed to add a built in sternum strap and hip belt. I have been testing this bag out for the past few months and mainly using it as a day bag and some hiking. 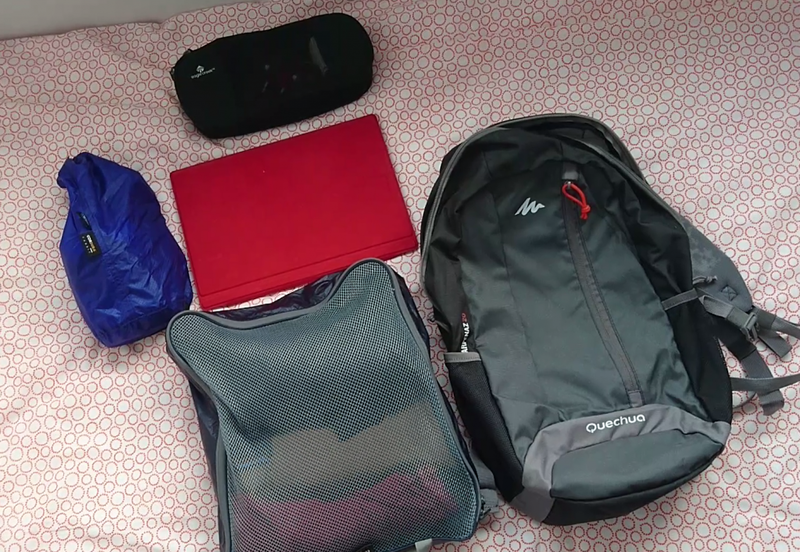 I have also done some trial packs, packing a full load of clothing, laptop, electronics and toiletries to see if it could in fact be a one bag carry on replacement. One of the best things about this bag is how lightweight it is meaning that you hardly feel it on your back. Another great thing about this bag is it also has a water resistant face material that water runs off. I did experience a few minor problems with the bag though. The first was the zip cover flap that hides the zipper from the rain actually caught into the zippers teeth and I almost couldn’t get it unstuck. So that’s something to be careful of when zipping and unzipping the bag. Another negative point about this bag is that there is no internal divider or sleeve. It would be great to have some kind of sleeve like in my Goruck SD20 to slip a laptop into to keep it separate from the other things in the bag. Finally lets talk about the comfort of this bag. It has generously padded straps and the back panel is also padded meaning that its always comfortable against your back no matter what you pack into it. The built in sternum strap and hip belt also provide further comfort for heavier loads as well. If you look closely at the straps you can see they’ve added elastic loops to stop the loose strap ends from flapping around. This is a really great feature and really improves the comfort and usability of the bag. 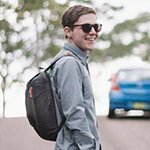 Overall I really like this bag, I think the size and weight are great and it has a lot of great features for a really affordable price. However my perfect bag would have full panel loading zippers and a separate laptop compartment, but for the price this bag is really hard to beat whether you use it as a day bag or for a weekend bag. Definitely worth checking out if you have a Decathlon store near you. It is also available (although a little more expensive) on amazon here.